I'm so excited about this! 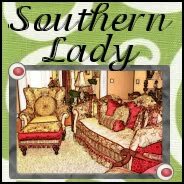 I know you remember Nancy from the Southern Lady blog. Nancy blogged for several years from her beautiful home in Tennessee. She organized parties for those of us who love red in our homes. Well you know how life gets busy! Nancy went back to work and got so busy that she decided to stop blogging. I still talk with her by email and she has agreed to share her NEW home with us. Pass the word and make her feel welcome!! I love home tours! Can't wait to see it! O, yes...at one time, her blog was one of my favorites. Glad she is sharing her home thru you. How wonderful! I miss her blog. Looking forward to the tour. Very cute and charming. I love to look at other people's beautiful homes.